The drapes are installed using our pipe & base rigging. This is the industry standard system for hanging fabrics in rooms with no fixing points, meaning the drapes will hang level and can be used in any venue. This system also allows us to partition rooms and totally change the layout of your venue. For example, at your Wedding you may wish to divide a room into a drinks reception area and a main seating area. White Drapery is the perfect way to dress your event, enhancing even the most of plain of venues and creating beautiful event spaces. You can hire our white drapes to cover walls or partition rooms and will totally transform any venue they’re used in. Our white drapes will be professionally installed and steam cleaned to remove any creases from storage or transport. This ensures they will look fantastic when your guests enter the room! We also supply small sections of drapes to sit above doorways, meaning entry and exit points can be preserved, whilst ensuring a seamless look. Our Black Drapes are a great way to transform your venue, creating a warm and cosy atmosphere. Ideal for Weddings where you want to create a real party atmosphere for your evening celebrations. Our Black Drapes are made from theatrical grade wool serge, ensuring a clean and crease-free finish, so they’ll always look smart for your special day. 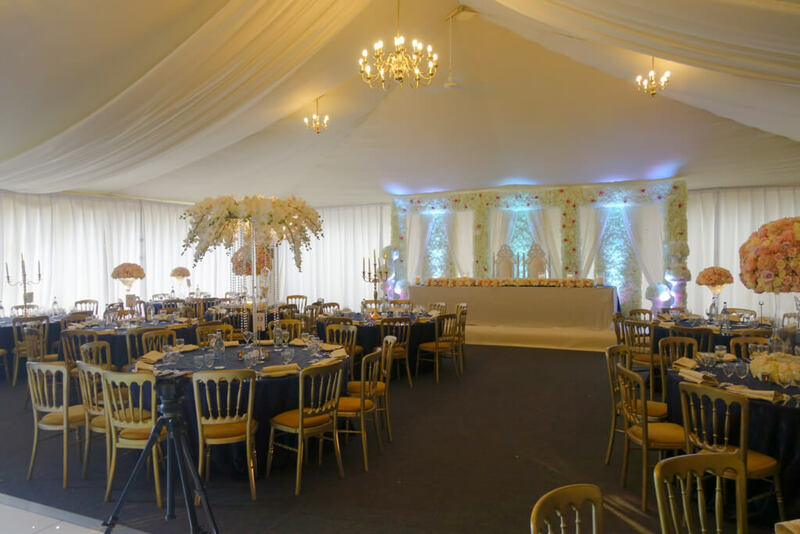 We stock various sizes, meaning the drape can be planned to suit your exact requirements. We can cover whole rooms, or just surround certain areas of your chosen Wedding venue. Black wool serge drapes can be easily combined with white drapes, or other coloured drape overlays to break up the black – or why not use our ShowLED starcloth to create a feature wall? Our black drapes are installed using our pipe & base rigging. This is the industry standard system for hanging fabrics in rooms with no fixing points, meaning the drapes will hang level and can be used in any venue. This system also allows us to partition rooms and totally change the layout of your venue. For example, at your Wedding you may wish to divide a room into a drinks reception area and a main seating area. Our Black Drapes will be professionally installed for you along with wooden door surrounds, which maintain entry and exit points can be persevered, whilst ensuring a seamless look and complying with fire regulations. To give an estimate for draping your venue, we require the length, width and height of the room as a minimum. If you have a full floor-plan, then we’ll be able to give a more accurate quote. As part of our service, we can also visit your venue to check the measurements so you can be sure our team bring everything they need.